The particular planting of nice-hipped roses staring back at me did not have rugose leaves. What’s more, the hips were about 3/4 of an inch across and bright red. Hips of rugose rose are usually an inch or more across and orangish-red. With this slightly different morphology and the fact that rugose rose is listed as an invasive plant, I assumed that the nice-hipped roses, recently installed as landscape plants, were another species. With such nice hips, the plants could possibly be dog rose, R. canina, the other rose species valued for its hips. The lack of sepals on the hips also pointed the finger at dog rose. (Rugose rose hips have persistent sepals.) A even closer look would have nailed it; rugose rose’s stems have numerous prickles throughout their length while bold, large, wide, downward-facing thorns line dog rose stems. But I didn’t look closer. Dog rose, although much less frequently seen, is also considered invasive in some places. 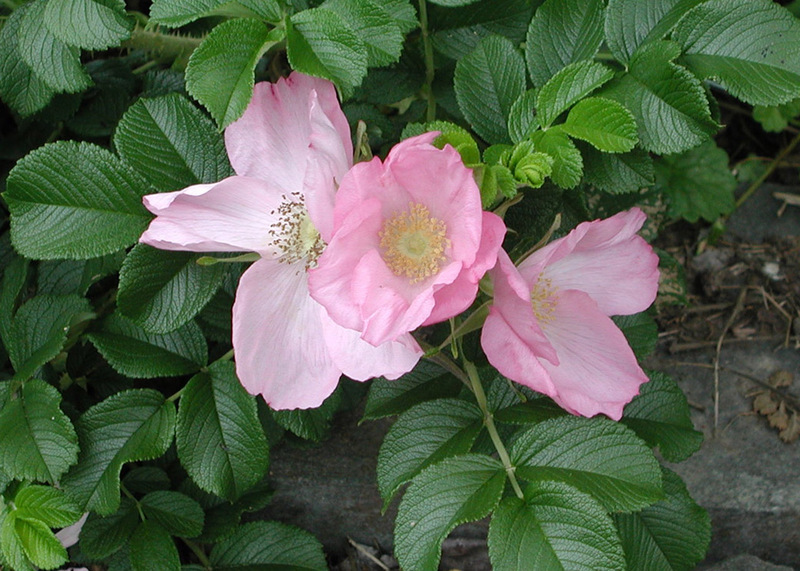 As potentially invasive plants, rugose rose or dog rose should be easy to grow from seed. But no. I’ve propagated roses from seed, and it’s a slow process. Rose seeds, like those of most other fall-ripening seeds of temperate zone plants, have a physiological dormancy that prevents their immediate sprouting, the consequence of which would be death from cold. So they just sit in moist earth until they have experienced a number of hours of chilly temperatures — 30 to 45° F is ideal — before sprouting, at which time winter has presumably given way to spring weather. Instead of moist earth, that chilly habitat could be within the refrigerator in a plastic bag filled with peat moss and perlite. But rose seeds have another impediment to germination: a tough seed coat. Plant the seed outdoors and shoots might not poke through the surface of the ground for 2 years. The first winter and summer are spent softening the seed coat, making it permeable to moisture. Beginning the second fall, chilling hours begin to accumulate so that by the second spring, the seed can awaken and grow. I did pluck a few fruits from that Rhode Island, nice-hipped rose bush, and plan to make new bushes. But I’m too impatient to wait 2 years. “Scarifying” the seeds is a quick way to make the seed coats more permeable. Nicking them with a wire cutter does the trick but would be difficult with such small seeds. An hour or so in warm, concentrated sulfuric acid — followed by a thorough rinsing in water — is likewise effective but a bit dangerous. I’ll follow Mother Nature’s lead and soften the seed coats by keeping the seeds warm and moist. No matter how the seed coat is softened, subsequent cool, moist conditions are still needed before the seeds will sprout. There’s barely time to get those seeds growing this spring. Two months in moist warmth followed by 2 to 3 months in moist peat and perlite in the refrigerator should awaken them. It’s exciting to check the bag in the refrigerator because, once mechanical and chemical barriers to germination have been overcome, a bag of seeds is usually transformed to a bag of white root sprouts, all at once, as if a switch had been turned on. I’ll have to make up some extra peat-perlite mix. 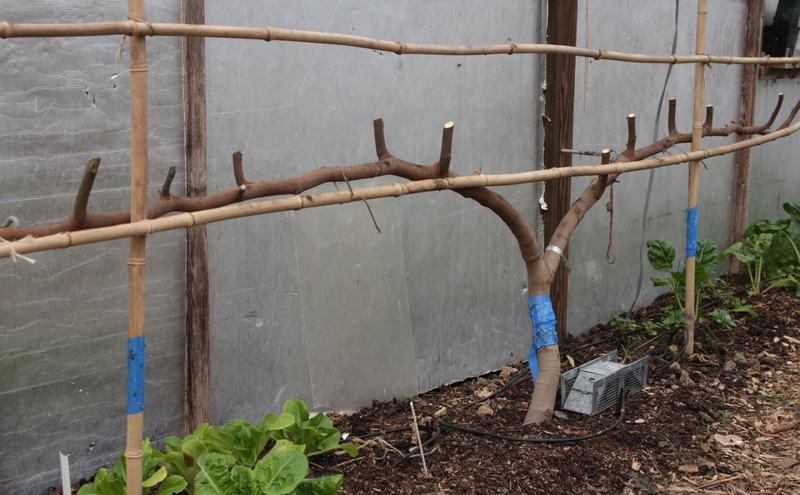 Cutting all the vertical shoots of Rabbi Samuel fig espalier back to the horizontal arms of the permanent “T” framework have yielded a pile of long stems. I can’t bear to throw them away because every foot-long section has the potential to make a whole new plant. The rooting media for these hardwood cuttings? Peat and perlite again. 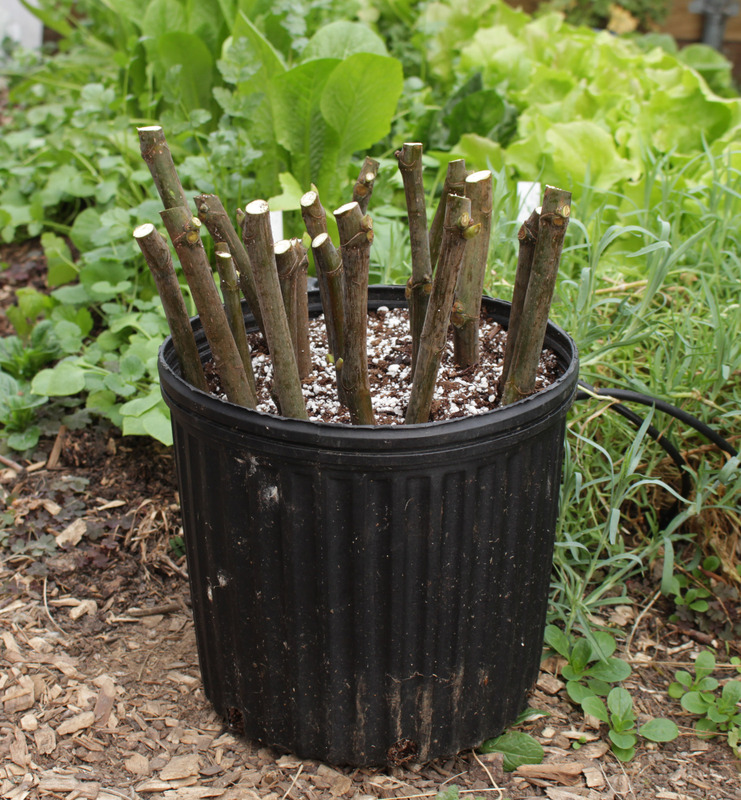 A bunch of the stems in a deep pot with just their top buds up out of the peat mix should sprout and root by spring. Not sure what I’ll do with all the resulting fig plants. I’m also not sure what I’ll do with all the anticipated rose seedlings, especially since I’m not even sure of their species. I did telephone the public works department of the Rhode Island town where the roses were planted and was told that they were Rosa rugosa. I think they are wrong. No matter: Rosa rugosa is one of the most fragrant roses with deep pink, sometimes white, flowers that are borne all summer long. 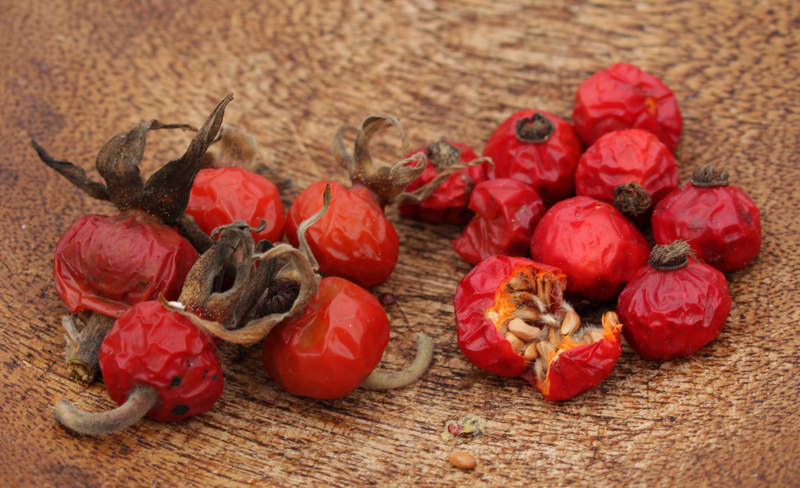 Also, like dog rose, with nice, fleshy hips, good enough fresh and excellent for jam and tea. This entry was posted in Flowers, Fruit, Gardening and tagged espalier, Rabbi Samuel fig, Rosa canina, Rosa rugosa, scarification, stratification. Bookmark the permalink. Trackbacks are closed, but you can post a comment. Hello Lee, I would surely take one of your rooted fig tree’s off of your hands in the spring!!! Please let me know. I really appreciate your blog, and all of the great information it contains. I also love your books! Thanks for all that you do, Happy New Year too! Sorry, I don’t ship plants. I have a plant sale here once a year, in May. I am reminded of the Rugosa roses that adorned the coast of Maine in Belfast where I lived for a time. I believe those were truly Rugosa, but I didn’t have your expert tips to help me identify. Are the dog roses as hardy? Dog roses are quite hardy. I like rugosa better.